On August 6, 2008, a vigorous seismic swarm was detected in the vicinity of Kasatochi volcano in Andreanof Islands. Starting at 15:00 UTC on August 6, the intensity and frequency of the earthquakes rapidly increased resulting in ~1,100 events located over the course of 48 hours during the most energetic part of the swarm. The largest earthquake, magnitude 5.8, occurred about 27 hours into the sequence and about 3.5 hours before the first aerial ash discharge from Kasatochi was detected by the Alaska Volcano Observatory through satellite data. This discharge was followed by two more explosions, also detected via satellite monitoring. The 3rd explosion consisted of nearly continuous ash emissions and declined in frequency and intensity through ~22:00 UTC on August 8. The seismic swarm intensity started to decline at ~18:00 UTC on August 8, and continued to decline through the end of August. Overall, there is a strong causative relation between behavior of the seismic swarm and the eruption episodes. 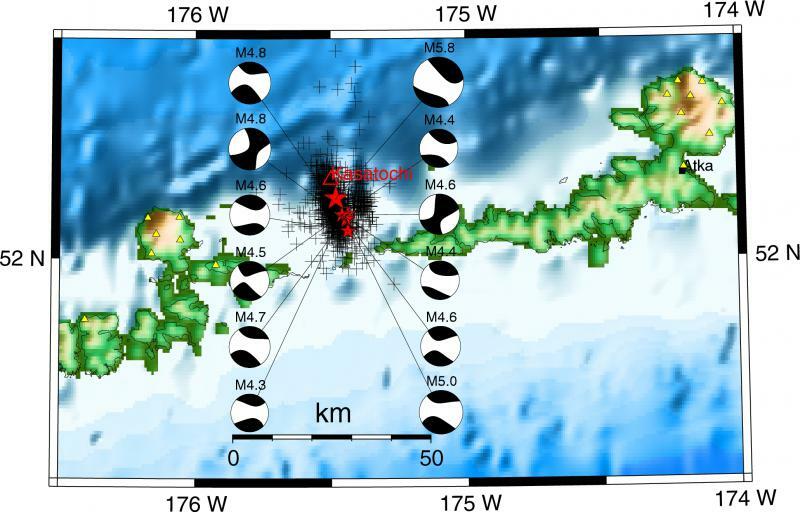 Due to seismic network limitations in the region (all stations are in a linear array along the island arc), determining accurate locations of the Kasatochi seismicity became a challenge. The locations have much larger uncertainties in the N-S direction than in the E-W direction, and overall are poorly constrained. Moment tensor inversions of the 12 largest events resulted in solutions with large non-double-couple components. The consistent orientation of the moment tensors, combined with rupture lengths of a typical magnitude 5.8 earthquake and knowledge of the likely regional stress field, suggests intrusion of a dike system. This dike system may extend several kilometers from the volcano in a possible orientation ranging from NNW-SSE to E-W.